Since first reading about electronic paper displays developed by E-Ink, I've eagerly awaited their arrival. Electronic paper displays are readable from any angle, high resolution, incredibly thin, use extremely little power, and can even be flexible. Currently the displays are grayscale, and text appears in black on a white background. Also once something is displayed on the screen it stays there without using any power; energy is only needed to change the image. All those attributes make the displays perfect for a new breed of devices: electronic document readers, like Sony's E-Book reader. The hope is that e-book readers can replace everything from printed books to newspapers. Imagine going on a vacation with a dozen novels and travel guides all in one in compact device. Less paper bulk isn't just convenient for you, it's also great for the environment. The potential for signage is also huge, imagine a posted train schedule that looks just like paper but can be changed instantaneously, inexpensively, all with minimal energy use. However, there's a significant downside to these displays: the refresh rate is between 1000ms and 500ms (or 1 second and .5 seconds). That's at best about about 100 times slower than an LCD display. That may be acceptable for an electronic book or signage, but until the refresh rate is dramatically decreased we may not see electronic paper displays in many PDAs, smart phones, and other gadgets that need really snappy interfaces. I had originally thought that electronic paper displays were a perfect fit for the MedTab, a PDA for medical professionals, but with such a slow refresh rate it now seems like the device has the potential to annoy a lot of busy and impatient doctors. The Illiad by iRex, another device using electronic paper displays, has pen and tablet capabilities. Which is a great feature, especially for those of us who like to make notes in the margins of our books. But I cannot imagine writing on a surface that takes (at best) half a second to display what I just wrote; it would be maddening. You know what? I've been thinking about this for a week now, and I've been dreaming about it. Don't you think it'd be great to have this reader in a bigger size, like 24x36, and be a touch screen? Everyday it makes me sick and sad to see whole slew of construction documents to go in a recycle bin. Yes, I know these sheets of paper are going to be recycled, but sometimes, due to one single spelling mistake, we have to plot out another 10 sheets of CD set! What a waste of paper! Right? It makes me mad! Well, with readers like this (if touch screen), it would be unnecessary to plot out at least half of the process drawings, AND the project managers would be able to fix the errors on screen while reviewing... The reason why we have to plot them out is because they prefer reviewing these documents on paper, not on screen. But since this screen mimics paper, it would not hurt our eyes that much... Now, that would be awesome. I've sort of been thinking the same thing. At my old job, I used to help prepare these 30+ page documents, and I'd have to print them out and distribute them for a 20 minute meeting. Invariably some people wouldn't even show up, so I'd be stuck with extras. It would be so great if there were a 8.5" x 11" size reader that everyone had. Then when people showed up to the meeting I could wirelessly send the document to everyone's reader. No wasted paper, and so much more convenient. The problem is that these displays are still quite expensive. 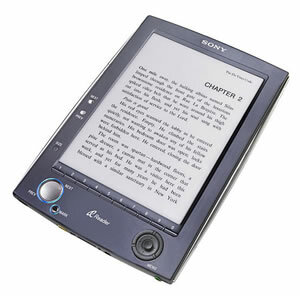 The Sony Reader, which only has a 3.5" x 4.8" screen, is $350. The actual hardware to run the device is quite modest, so I'd speculate that most of that cost goes is for the screen. Given that they are so expensive, I could understand why people might not what to use them on a construction site, or other situations where they could be easily damaged. But eventually the price will come down, and I'm sure we'll see these devices in both the situations we described. However, I still think a half second refresh rate is slow enough to drive people crazy, and really limits how useful a touch screen can be.